Yummy buns take an Autumnal turn with the addition of sweet Hokkaido pumpkin! Autumn is officially here, and what better way to celebrate than with pumpkin! I know, I know. The pumpkin train is massively over-traveled, but take this opportunity to get acquainted with my friend, the Hokkaido pumpkin. Its traditional name is red kuri squash (ウチキクリ) and is said to have a taste that’s rather similar to chestnuts. In fact, the Japanese word “kuri” is translated directly to chestnut. 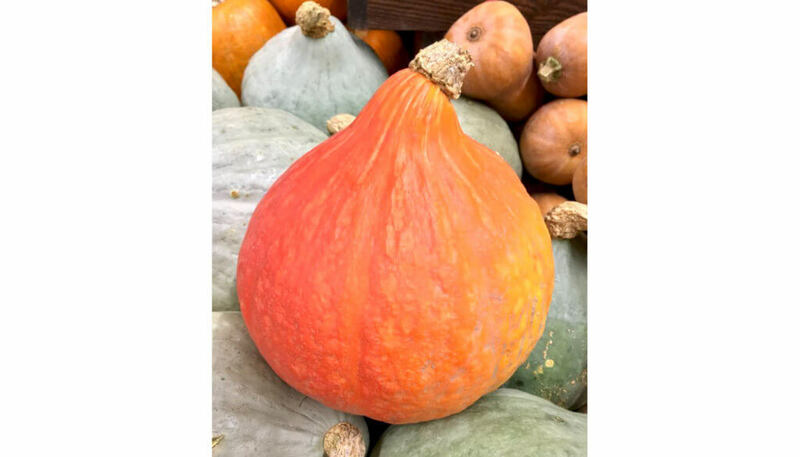 Hokkaido pumpkin is delicate, sweet, and nutty in taste, and its low-pulp flesh lends itself well to baking. August is the peak season for this squash, but even still, it may be hard to find at your local grocery store. If you’re lucky enough to get your hands on one, I highly recommend using it for this recipe. 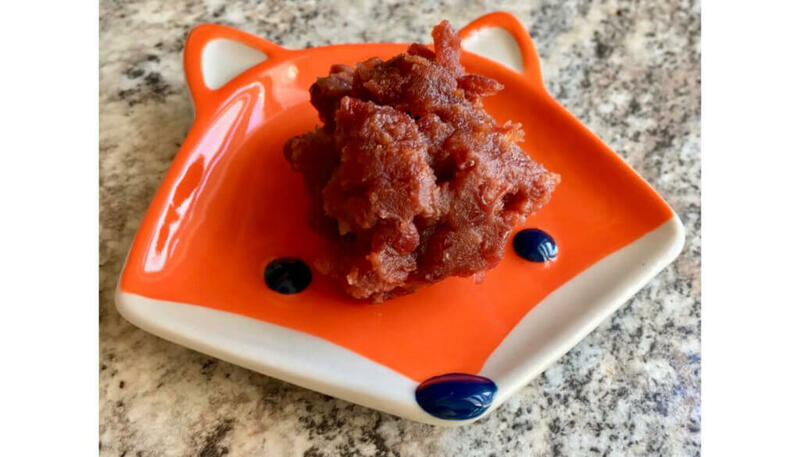 Visit Xuân-Minh’s blog Minh Cakes to learn how to make a Hokkaido pumpkin into a puree. The real star of this dish is the sweet red bean paste filling known as anko (あんこ). Anko is made of azuki beans that have been boiled, sweetened, mashed, and then thickened into a paste. Wait a minute, beans? Yes, my friends. Azuki beans are the base of this delectably sweet paste, truly a far cry from typical Western sweets, but believe me, it’s so good. Even though there are many types of anko, the two most common are tsubu-an and koshi-an. Tsubu-an (つぶあん) has a chunkier texture due to pieces of beans that have only been partially mashed. Koshi-an (こしあん) is a smooth paste that has been pureed and passed through a sieve to remove the bean skins. For dorayaki, tsubu-an is preferred because the chunkier texture gives the dessert structure. Nami of Just One Cookbook has a fantastic recipe for both tsubu-an and koshi-an on their website. However, if you’d like a quicker anko option, you can always head to the nearest Asian market and pick up a can of sweet red bean paste, which is normally ogura-an (小倉あん), a mixture of tsubu-an and koshi-an. Despite dorayaki (どら焼き) being the most favorite food of Doraemon, its origin can be traced much further back than the 1970s. “Dora” is the Japanese word for gong, and “yaki” means cooked on dry heat. As the story goes, Saito Musashibo Benkei, a legendary warrior monk from the Heian Period, was injured and taken in by an elderly couple. Benkei fully heals and bids the couple’s farm farewell. However, he accidentally leaves his gong, and the elderly farmer, not knowing what it is, uses it to fry pancakes. It’s also possible that the name is just derived from it’s gong-like appearance, but let’s be a little romantic here, okay? Before the 20th century, dorayaki were folded with the anko in the middle of a thinner cake, like a soft taco or an omelette. Usagiya, a confectionary in Ueno, is credited with the first modern fluffy pancake sandwich design, which was inspired by castella cake, kasutera (カステラ), a Japanese sponge cake. 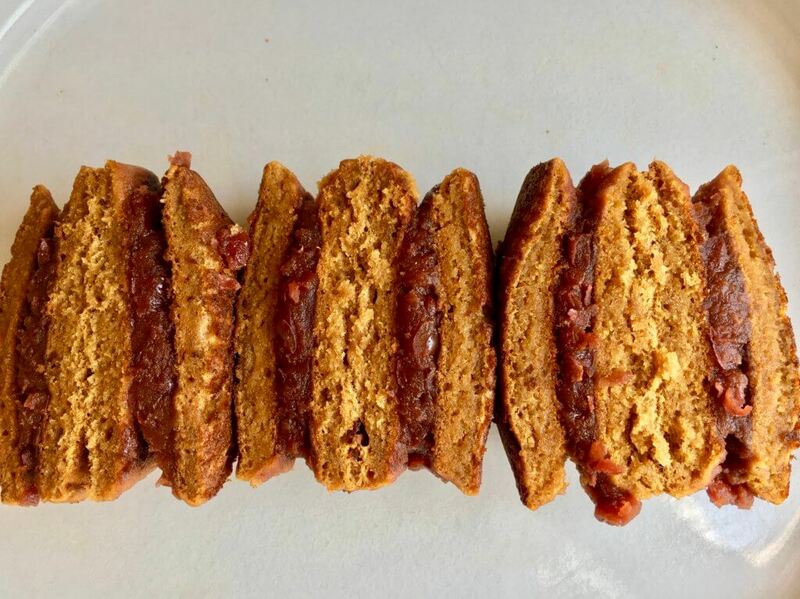 Pumpkin dorayaki has some notable differences than traditional dorayaki. First of all, it contains pumpkin (duh), but the pumpkin changes the texture and the moisture content. It replaces the eggs in traditional dorayaki, and the resulting pancake is more moist and tender without the binding power of egg white protein, which hardens as it is heated. Pumpkin causes the batter to be thicker than normal, making it necessary to smooth and flatten the batter in the pan to ensure even cooking. Also, the presence of pumpkin changes the color. So when pan-frying the cake, the desired golden brown appearance is a much darker brown. Another difference is the use of brown sugar. Traditionally, dorayaki uses honey as the sweetener, but since honey is not vegan, I opted for the richer flavor of brown sugar. I’m sure you can use any type of vegan granulated sugar that you’d like (organic cane sugar, coconut sugar, etc. ), but it may effect the liquid content of the cake slightly. Another addition is non-dairy milk. Normally, water is the liquid used to thin the batter, however, I really enjoy the extra layer of subtle flavor the non-dairy milk contributes. The final difference is really just presentation, and in all honesty, it was just because I couldn’t get the dome shape right. Thus, my pumpkin dorayaki looks a whole lot like whoopee pies or jelly sandwiches with pancake bread… maybe I’m onto something here. Next stop, PB&J pancake sandwiches! Add pumpkin puree to a mixing bowl. While using a mixer on medium speed, slowly add the sugar. Continue mixing and add baking soda, vinegar, mirin, and half of the water. Sift in the flours and mix until combined. Cover and rest the batter for 10 minutes at room temperature. Add 1/4 c. of the water and mix until combined. Add the remaining water 1 Tbsp. at a time, until desired consistency is reached. The consistency should be thick but fluid – a little thicker than normal pancake batter. Place paper towels on the countertop or another flat surface to cool the pieces once cooked. Heat a non-stick frying pan on medium. Add a little oil to the pan and spread it around using a paper towel. Use a spoon or scoop to add batter to the pan, making a disk about 4 inches in diameter. Use the spoon to smooth and even the batter into 1/8 inch thick. Reduce heat to low, and cook until the top starts to bubble and the edges firm. Use a spatula to check the bottom for a dark golden brown color. *Note – it may be darker than normal pancakes because of the brown sugar and pumpkin. Flip and cook for a shorter period of time – until just golden brown. Place each piece dark side up on the prepared paper towel covered surface to cool. This flattens the interior portion of each piece for a better shaped dorayaki – rounded exterior and anko-filled interior. Once pieces have cooled completely, add about 2 Tbsp. anko to the flat/lighter side of one piece and place another piece on top with the flat/lighter side facing the anko (down). Lightly press together, and voila! Dorayaki! * Anko (red bean paste) can be made or purchased. The style that is typically used for dorayaki is tsubu-an, but if buying pre-made anko, ogura-an style is the most common and may be used for this recipe as well. Emily is a plant-based chef out of Massachusetts specializing in alternative baking. She is a lover of dark chocolate, Brussels sprouts, and Earl Grey tea. You can find her scrounging around Pinterest for the most delicious looking dessert recipes. Thanks for the linkback! :* Those Dorayaki look amazing… must try them soon!